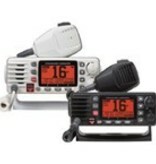 The GX1300 ECLIPSE is an affordable ultra-compact ITU-R M.493-13 Class D VHF radio that has been re-engineered to meet the IPX8 submersible waterproof rating of 4.92 feet for 30 minutes, redesigned with a new Easy to Operate Icon/Menu System featuring an oversized full dot matrix LCD (31 mm x 55 mm) to increase the size of the channels and navigation information* displayed. Simple installation, the radio’s rear chassis has also been reduced to 5.9” deep for greater mounting flexibility in tight spaces. The NEW ECLIPSE has been updated with some great new features, including DSC Test Calling and Automatic Position Polling making this a perfect choice for the budget conscious mariner in need of a full featured Marine VHF. Other great features include All USA/International and Canadian Marine Channels, programmable soft keys, NOAA Weather with Weather Alert, programmable Memory and Priority Scan, Dual Watch and a microphone with Clear Voice Noise Reduction Technology to eliminate unwanted background wind and engine noise. The ECLIPSE is capable of initiating a DSC Distress call, when activated, it transmits a digital mayday including vessel identification, Latitude / Longitude and time* to facilitate a prompt rescue. Additional DSC features include Individual, Urgency, Safety, Position Report and Send, DSC test call and Auto DSC channel switching. The GX1300 ECLIPSE is backed by an industry leading 3-year waterproof warranty.